With the increasing tensions being caused by the Trade Federation embargo, the Royal government of Naboo authorized the contstruction of the N2 Bomber. While always considered an anathema by the peace loving Queen of Naboo, the N2 did enter into a limited production run. While too few in number to play a major role in the defense of Theed, in later years Governor, then Moff, Panaka increased production of these vessels. 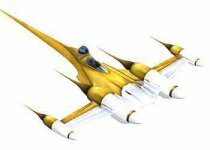 A powerful attack starfighter, it was rarely used, but proved a potent protector of Naboo when it was. May carry 12 Proton Torpedoes or Plasma Bombs.